eight years ago the Gujarat High Court had fined 756 industrial units in Odhav, Naroda and Vatva industrial areas in Ahmedabad district for polluting 20 villages in Ahmedabad and Kheda districts. The factories were asked to pay one per cent of their gross turnover of one year as compensation. The court entrusted the state's ministry of environment with collecting the money. The industrial units paid up. But the state government has since then been sitting on the Rs 13 crore instead of using it for the socio-economic uplift of the villages. "I don't know anything on that subject," says Mangubhai Patel, Gujarat's environment minister. Meanwhile, the situation in the villages has deteriorated further. Chemicals units in Vatva have contaminated groundwater to such an extent that water in the borewells is reddish in colour even at depths of 75 metre. Rohit Prajapati of Paryavaran Suraksha Samiti, an environmental group, says their survey confirms this. 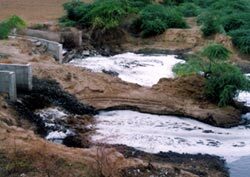 Industries in Odhav and Vatva discharge effluents in the Khari river, which passes through 40 villages. Khodabhai Patel, a farmer of Chosar village, says the contaminated water has destroyed soil fertility: In about a decade, the rice yield has declined by nearly 40 per cent." A recent promise made by the Gujarat Pollution Control Board (gpcb) about alternative arrangement of clean water in Chosar, with the help of Ahmedabad Municipal Corporation (amc), has also not been fulfilled. Young men here struggle to get married; nobody wants to marry their daughters in villages without drinking water. Harshad Shah, president of Green Environment Services Cooperative Society Limited, Vatva, promoted by the Vatva Industries Association, contends that pollution has been taken care of by the Society's common treatment plant. But Patel alleges the plant is of no use as effluents are openly discharged in the river. Shah also suggests that the compensation money should be handed over to the Society for the upgradation of the treatment plant.